United Methodist Women of First United Methodist Church Orange focuses on ministries with women and children. They provide opportunities and resources for women to grow spiritually, become more deeply rooted in Christ and put faith into action. The mission is to provide opportunities to equip women and girls to be leaders, provide transformative educational experiences, organize growth and flexibility, and work for justice through service and advocacy. 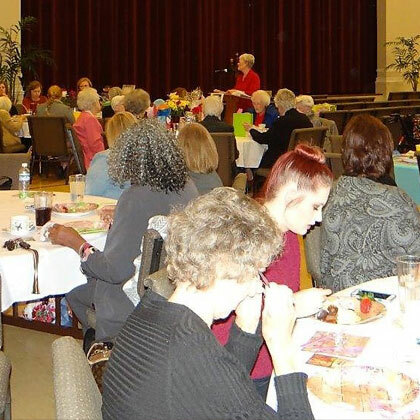 The UMW groups annually host a Ladies Tea, put together a service of Prayer and Self-Denial, assemble UMCOR kits, cook the Ash Wednesday meal and the dinner for the dinner theater, serve snacks at VBS (summer and December), and semiannually host the Ladies Dinner. Each December, elderly members of the church are treated to gifts from the group. Periodically, the UMW groups have a Time Apart—to meet at a member’s house for fellowship and devotion. All funds raised by UMW support local, national and international missions. For more information about the national group, please visit http://www.unitedmethodistwomen.org/. First UMC Orange has two circles that meet on the second Tuesday of each month from September-May. The Faith & Joy Group meets at 9:45 a.m. and the Love Circle meets at 6 p.m.